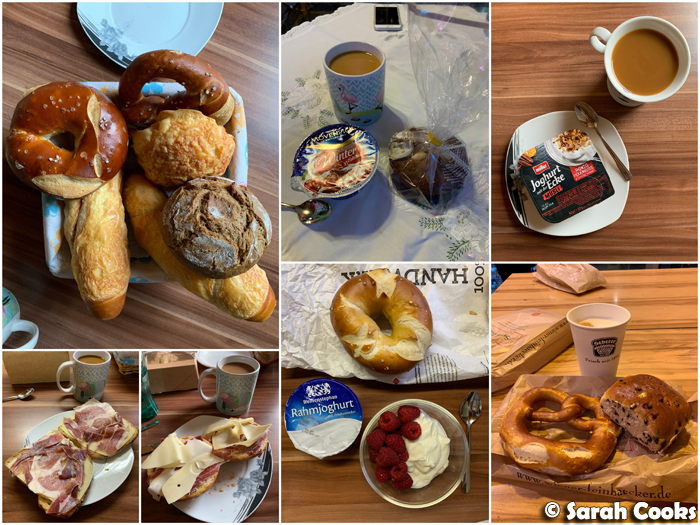 Sarah Cooks: Germany 2018: Wrap Up! Guten Morgen! Today I wanted to tell you all about our recent trip to Germany! It's going to be a bit of a wordy post - grab a cup of tea - but there's just so much I want to tell you about! It was such a great holiday, and we had the best time! 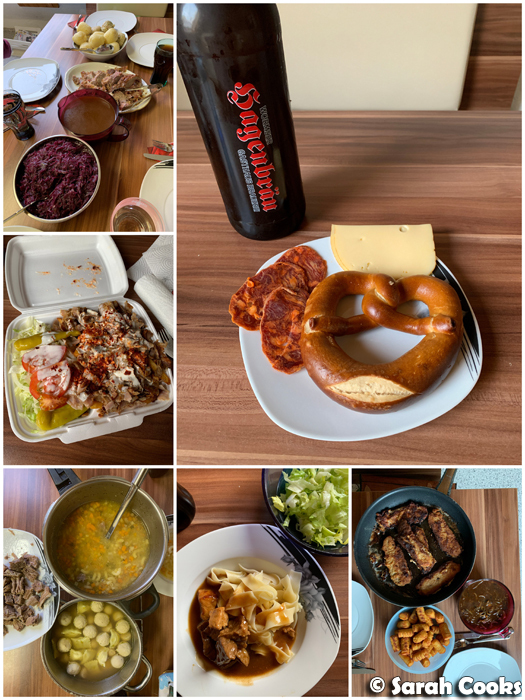 I already posted about the Christmas Markets and our German Christmas celebrations, and today's post will be all about the rest of the wonderful two weeks we spent there. 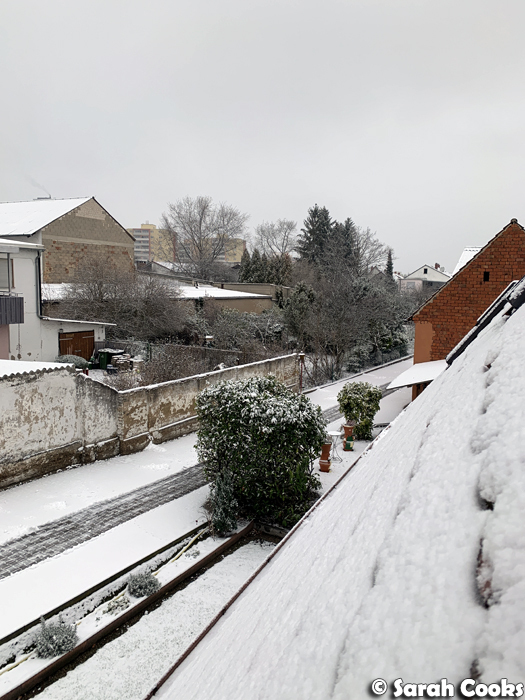 We weren't planning on going back to Germany this year at all, but fortuitous circumstances arose and we were able to squeeze in a quick trip over Christmas! Hooray! You see, Sandra had to be in London for work until mid-December, and seeing as we knew she'd already be so close to home, we thought we may as well tack on a visit to Germany after her work trip! One especially lovely aspect of the trip was that we got to celebrate our wedding with Sandra's family! As you may know, Sandra and I got married in Melbourne last year, but her family wasn't able to come for it, which they were quite sad about. It was so nice to be able to bring the celebration to them. Actually, it was funny - once we had our flights booked in, we thought we should organise a little celebration dinner for the family, and started Skype-ing with my in-laws to discuss ideas, and potentially inviting my friend Clarice to come from Paris for it. 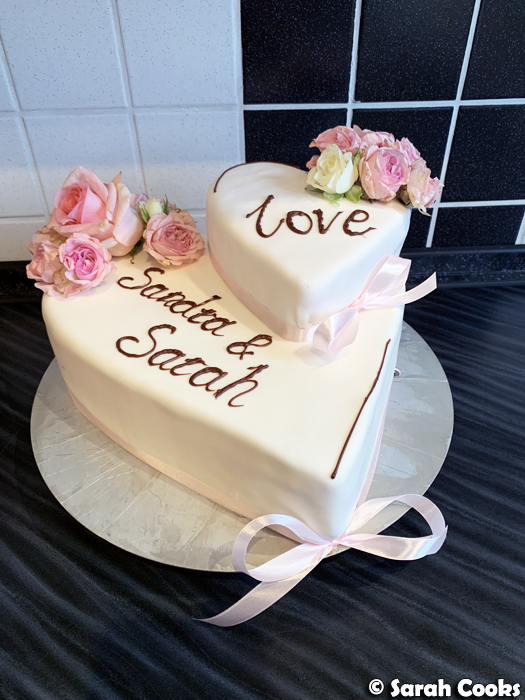 Surprisingly, they were weirdly non-committal about it... and then the next day, Sandra's sister called us and revealed that she'd already organised a wedding afternoon tea celebration for us, and it was supposed to be a surprise! WHOOPS. Sorry Tina! Luckily Clarice was able to come to Germany at that time and attend the (no-longer) surprise tea, and it all worked out! I bought tickets from Melbourne --> Singapore --> London --> Frankfurt, so that I could meet Sandra at Heathrow and fly to Frankfurt with her. Unfortunately... my flight from Singapore to London was delayed, so I ended up missing the London to Frankfurt connection. Boo! The nice folks at Qantas arranged new flights for me while I was still on the plane to London, but for some reason my replacement flights were London --> COPENHAGEN --> Frankfurt. No idea why! Of course this meant that poor Sandra and her parents were waiting for me for hours... and afterwards I learned that Sandra's dad had booked in a special welcome lunch for me at one of my favourite restaurants, Zum Tahlblick, which I missed out on. Schade! They went for lunch whilst waiting for me, and they said it was delicious even without me! Oh well, I guess now I can say I've been to Denmark?! 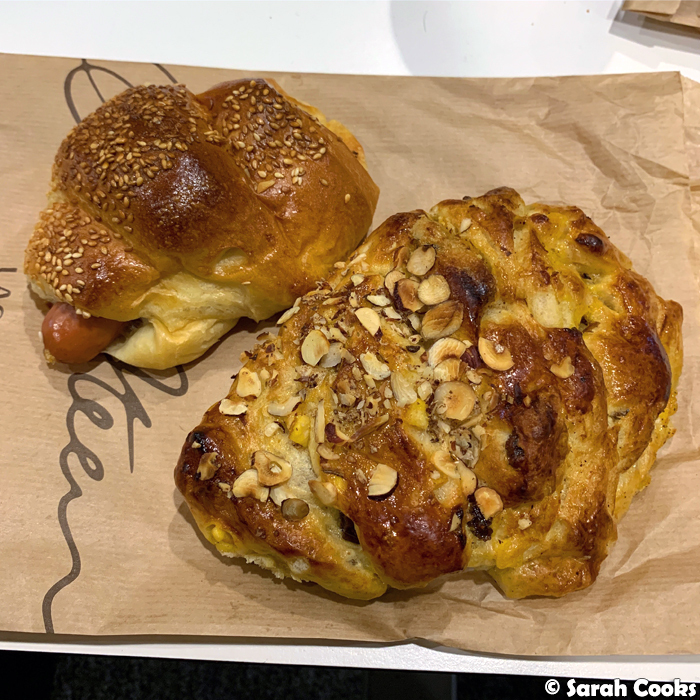 And a good consolation: the ridiculously delicious hot dog and raisin almond bun I bought at the airport. So soft and fluffy! Rushing between the new flights was a little stressful, but I got to Frankfurt in the end. Unfortunately, my suitcase wasn't quite as speedy as me, and it didn't come out on the baggage carousel. UGH. After some panicked discussion in my broken German with the nice folks at the luggage counter, they located it - still in Heathrow - and they said it would arrive later that night and that they'd transport it to our house the next day. The pressure was on because our wedding tea was also the next day, and I was going to Paris the day after that. But at least I'd gotten there safely and my suitcase had been located! In my feral plane outfit, without a change of clothes, no contact lenses, no skincare products, and no make-up, I felt like a damn yeti! Once we'd settled in at home (which was quick because I didn't need to unpack - hah), we went to a local shop and I bought some basic clothes and supplies so I could feel a bit more human. Aaaaaah. It was a good move because my suitcase only arrived mid-way through the wedding tea (you should have heard me yelp with excitement). Happily, the German side of family is chill AF and do not care about appearances - my €20 jumper dress and fluffy Ugg-style boots from the local supermarket centre were fine. More than fine! Let's look at the wedding tea! My sister-in-law Tina really outdid herself with the cakes and the decorations and the organising. (Even if we did ruin her surprise). Star of the show was this beautiful two-tiered cake from local Konditormeister Michael Oberfeld, with one tier of cherry-chocolate cake, and one tier of vanilla-raspberry cake. 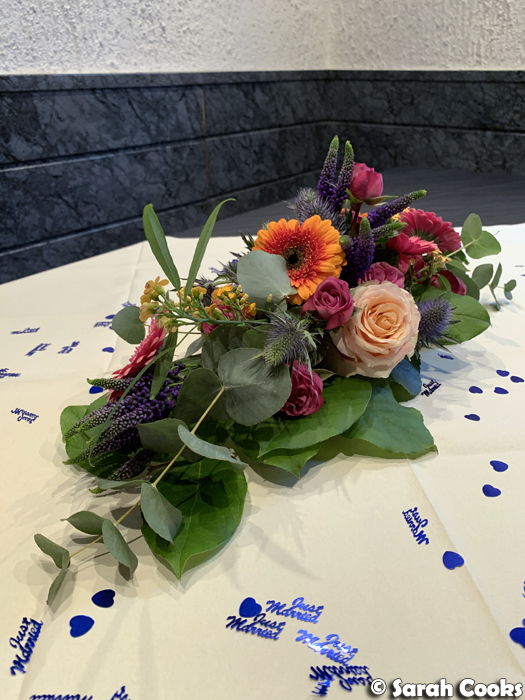 And the thoughtfulness went all the way to the decorations - she got little "just married" sequins, and had the floral centrepieces modelled on our actual bouquets from the wedding! It was so thoughtful and I was so touched. What a lovely way to celebrate with my German family and BFF Clarice! Vielen dank, Tina! Ok, moving on to regular food now. Breakfasts! I tried yogurt a few times in a vain attempt to eat healthily, but most mornings I was smashing loads of bread. Here are some lunches we had at home. 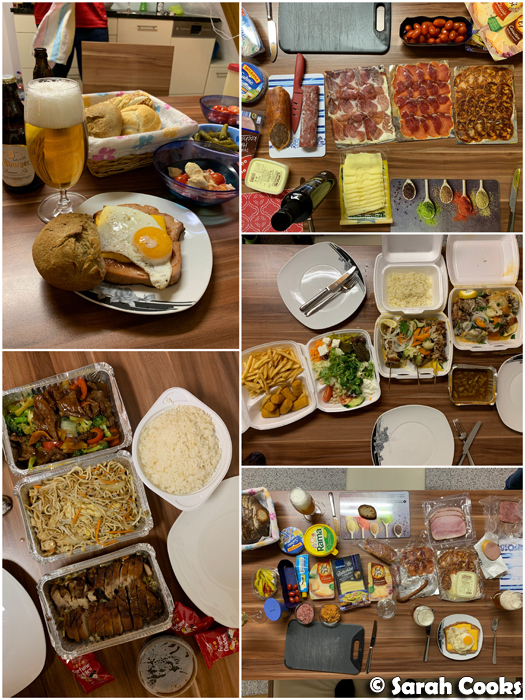 As I remind you each time I blog about Germany, lunch is the main meal of the day, and usually Sandra's mum cooks us something delicious. One day we also went to the local farm, Zum Kreuzhofbauer, for lunch. This place is a favourite of mine. Big hearty meals all around! We usually ate dinners at home, except when we went to a Christmas market. Home dinners were usually some kind of Aufschnitt (cold cut) situation. Sandra also bought £60 worth of jamon iberico (!!!) from London with her, so that kept us going for most of the trip! Sandra's dad also surprised us with takeaway from the local Greek restaurant one night (that had been our original idea for the wedding dinner, but obviously that was usurped by the wedding tea); and no trip to Germany is complete without Sandra torturing me with "Chinese" food from the local Chinese takeaway. (Actually tasty but bears very little resemblance to any Chinese food I've ever seen). 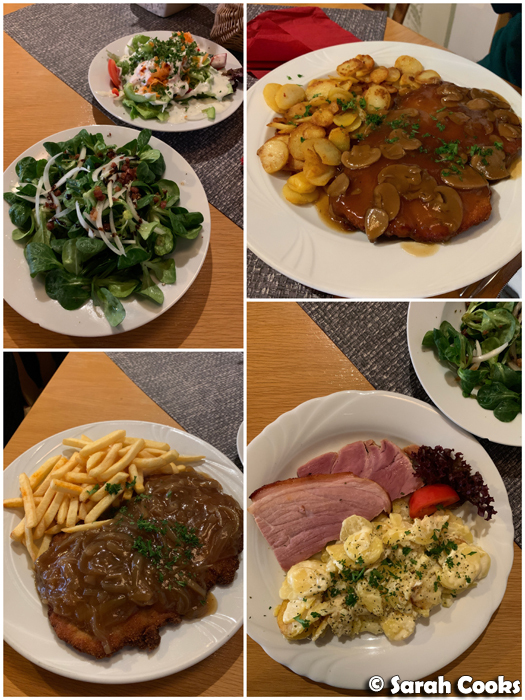 One night we went out for dinner at Zur Krone, Lampertheim's oldest restaurant that is famous for their giant schnitzels. One day I will tackle their Cordon Bleu! 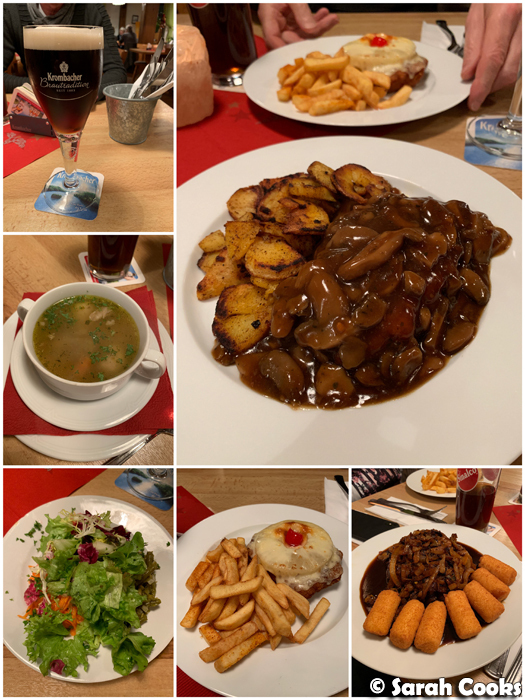 But for this visit it was a nice and classic Jägerschnitzel mit Bratkartoffeln (pork schnitzel with mushroom sauce and fried potato slices). 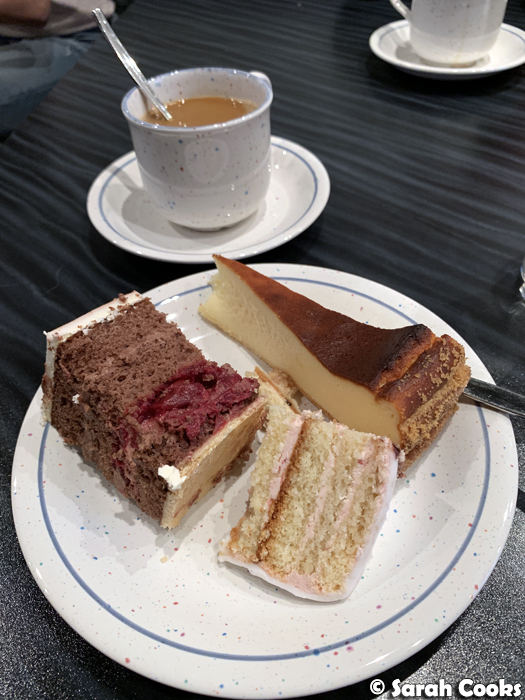 We ate a lot of cake in Germany. Apart from our wedding Kaffeeklatsch, it was also my nephew's birthday while we were there. 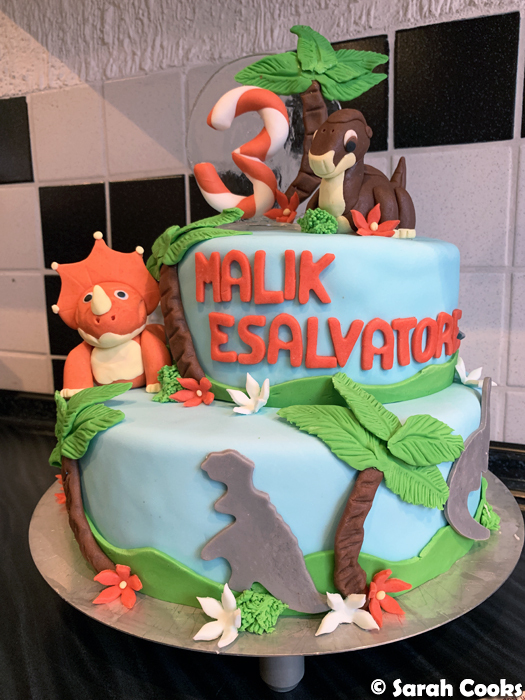 He's really into dinosaurs! This spectacular cake was another Michael Oberfeld creation. Inside we had chocolate and peach in one tier, and raspberry-vanilla in the other tier. 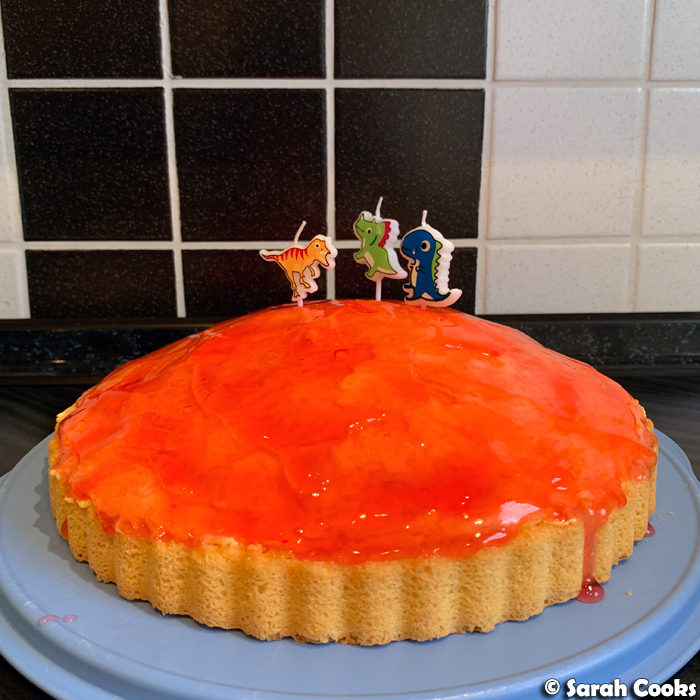 At his birthday party, we also had a Schüttelkuchen, which is basically a sponge base topped with a light and airy mandarin-cream mixture, covered in a glaze. 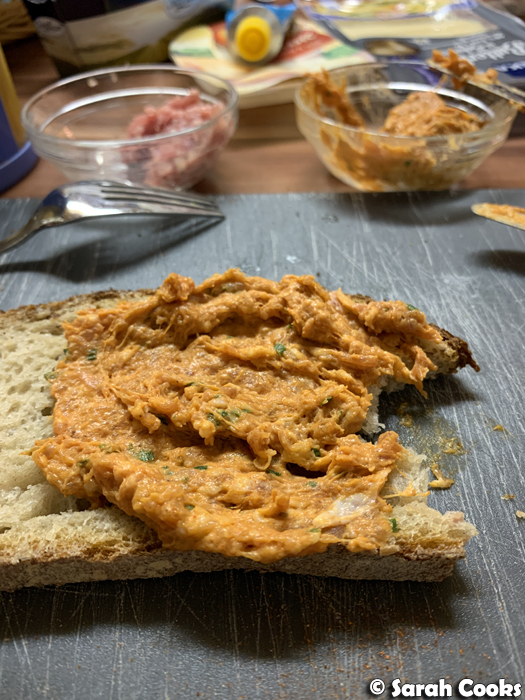 "Schütteln" means "to shake", and essentially the name comes from the action of shaking the cream mixture in a large covered bowl or container to whip it. (Good). 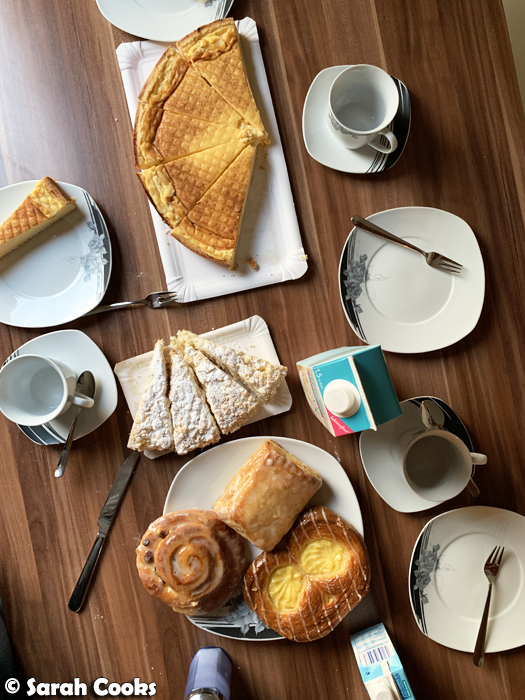 On another afternoon, we got a couple of classic cakes in (Rahmkuchen and a Streuselkuchen), plus some pastries (pudding scroll, raisin scroll, apple pocket). The cakes were from Blüm in Bürstadt, and I think the pastries were from a local bakery, maybe K&U or Hug. 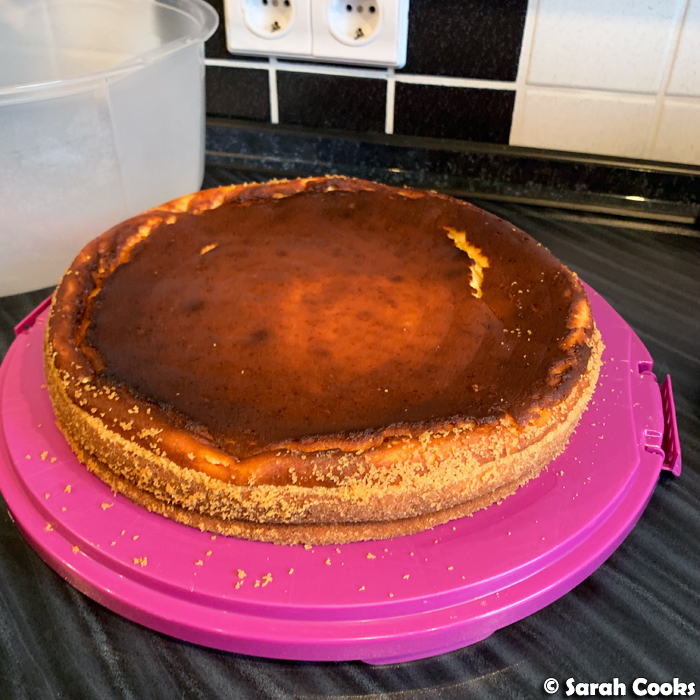 Rahmkuchen is literally "cream cake", and is kinda like a very light baked cheesecake. There's a pastry base, and the filling is primarily made of cream and sour cream. 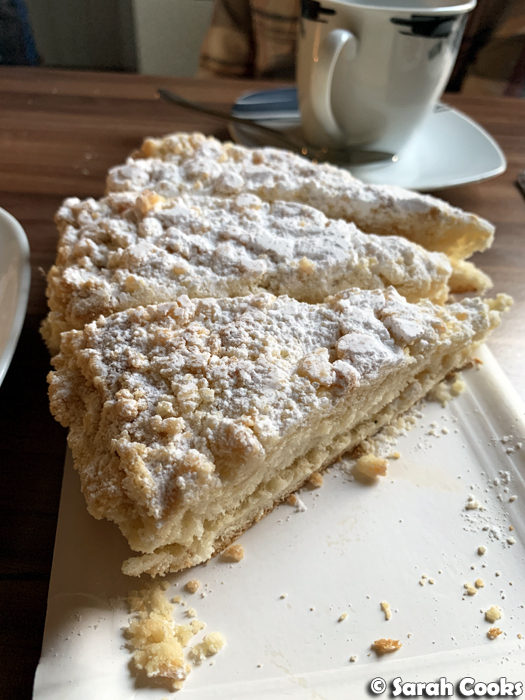 Streuselkuchen is a simple yeasted dough covered in crumble. I love them both! 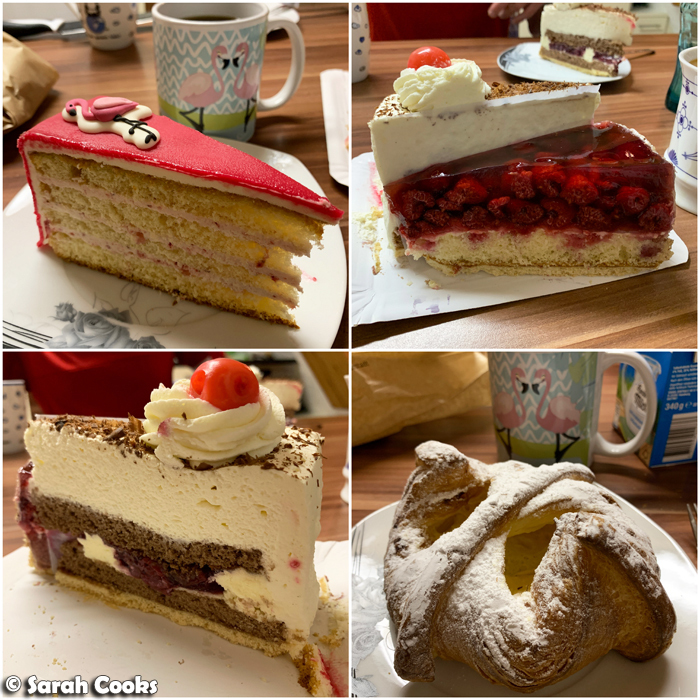 These next cakes were from Friedle in Bürstadt, apart from the Käsetasche (cheese danish) that came from Blüm. The cheese danish was mine, and it was excellent! I can never resist cream cheese in pastry. The flamingo cake was literally the first time I'd ever seen a novelty cake in a bakery in Germany in my eleven years of visits. It was raspberry vanilla, and it was very nice. When I posted photos of the Black Forest cake on Instagram, I had quite a few people respond, shocked at the amount of cream! Well, that amount is perfectly standard in Germany. 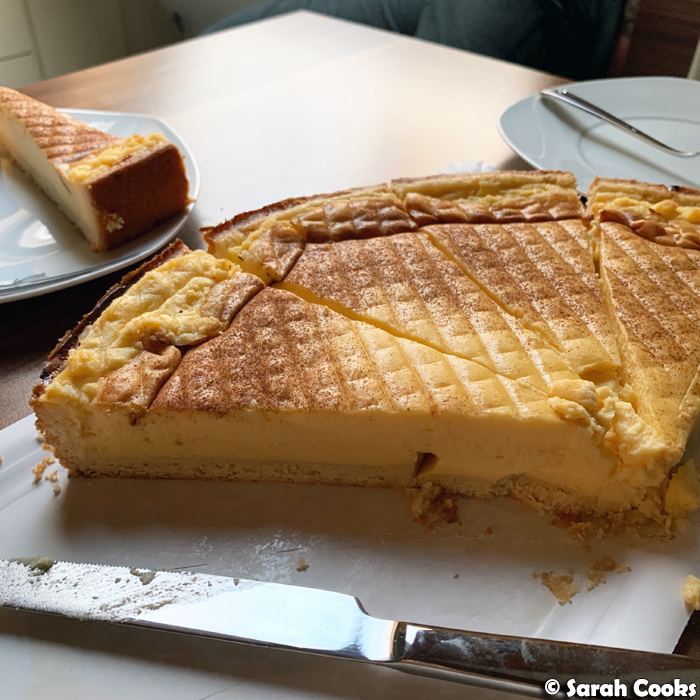 In the book, Time After Time, Ben Elton describes German cakes as "really no more than whipped cream delivery systems", which I think is perfectly apt! Ok, these next couple of things I probably should have included in one of my Christmas posts, but I didn't. So here we are. 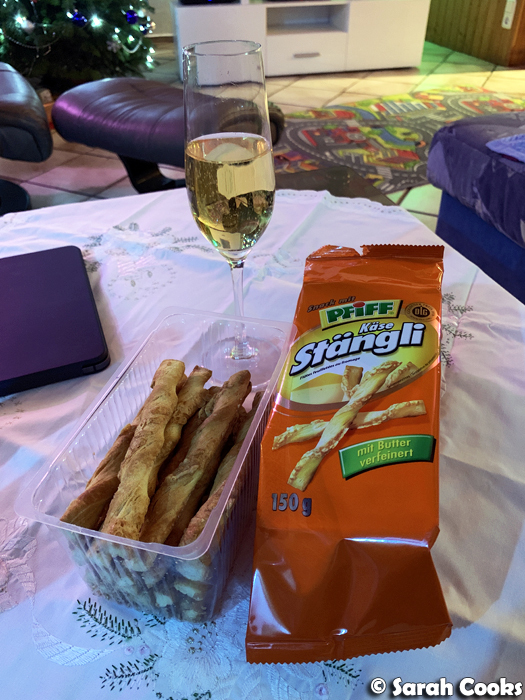 These are some little Christmas snacks I had that I wanted to tell you about! First up: Mannheimmer Dreck. 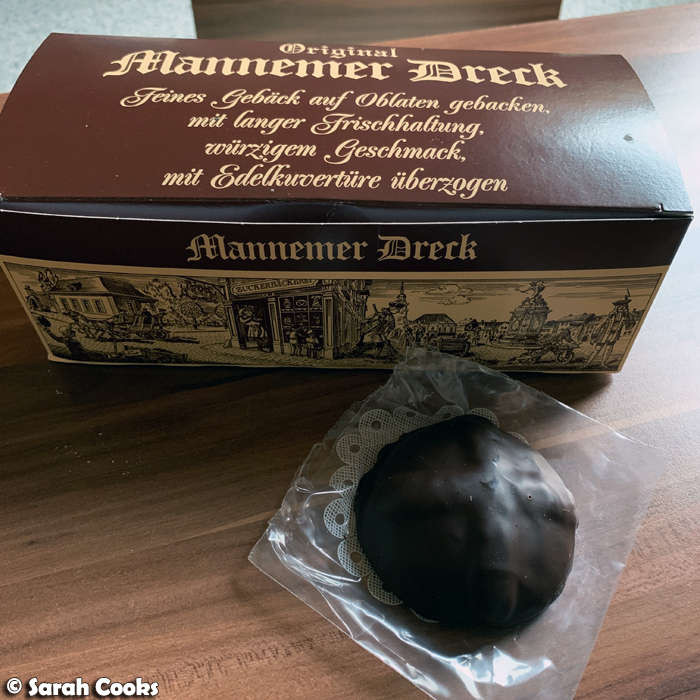 I hadn't heard of these before, but they're a Mannheim specialty, an almondy-spicy-fruity soft cookie, piped with a cross of marzipan and dipped in chocolate. They were quite similar to an Elisenlebkuchen (soft gingerbread), but with more chunks of dried fruit throughout. I liked them! 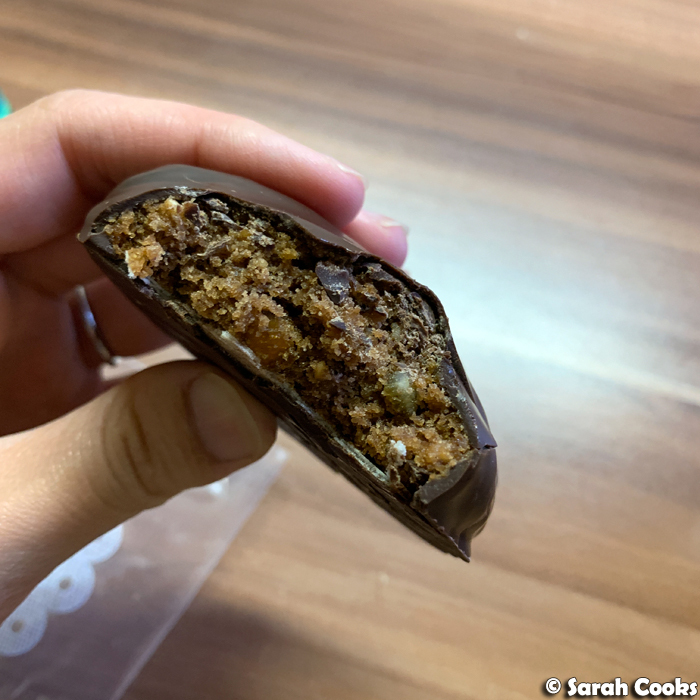 Now, this next one is not particularly Christmassy, but I did eat them on Christmas, and I really liked them, so I wanted to have it here on the blog as a record. 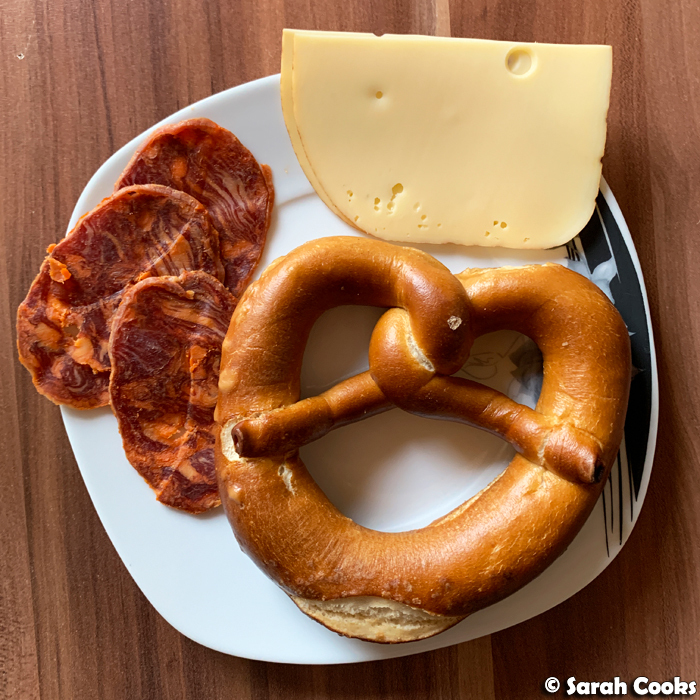 Next time we're in Germany and I'm wondering what snacks to buy, these Käse Stängli should go to the top of the list! They're just puff pastry with cheese, AKA cheese straws. They're buttery and crunchy and salty and super addictive. Let's finish up this post with a few things we brought home. 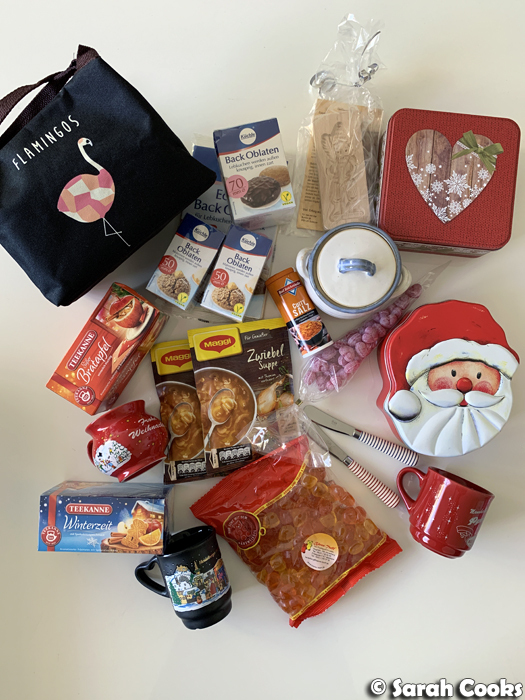 Flamingo insulated bag (gift from my sister-in-law); Back-oblaten baking wafers; Spekulatius mould; Christmas cookie tins; Blue and white ceramic pot made in the Odenwald (bought at the Bensheim Christmas market); curry salt; onion soup packets; roast apple & wintertime teas; Glühwein mugs; gummi bears; mulled wine candy; cute stripey butter knives (gift from Clarice for the wedding tea). Milkas. Of course. The chocolate bars, Kinder Riegels, Kinder Happy Hippos and some of the biscuits were part of a chocolate hamper that Sandra's cousin gave us for the wedding. (Have you had Kinder Happy Hippos? They're so good!) 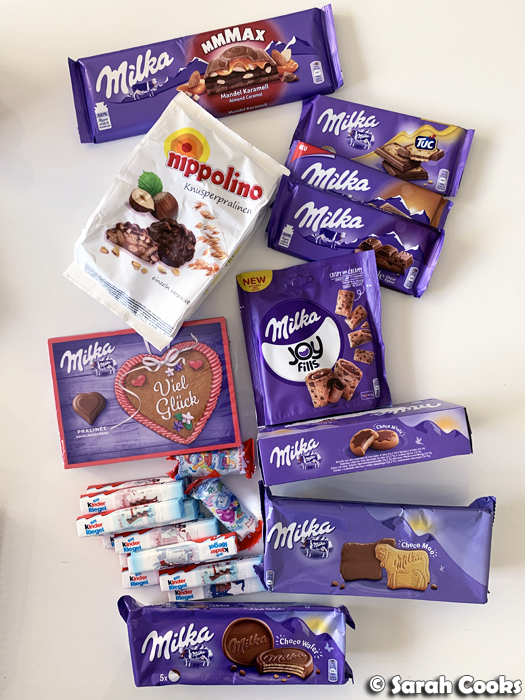 I also bought extra biscuits and chocolates and snacks to bring home because I LOVE Milka! Ok, so that was all I wanted to share about our awesome holiday. 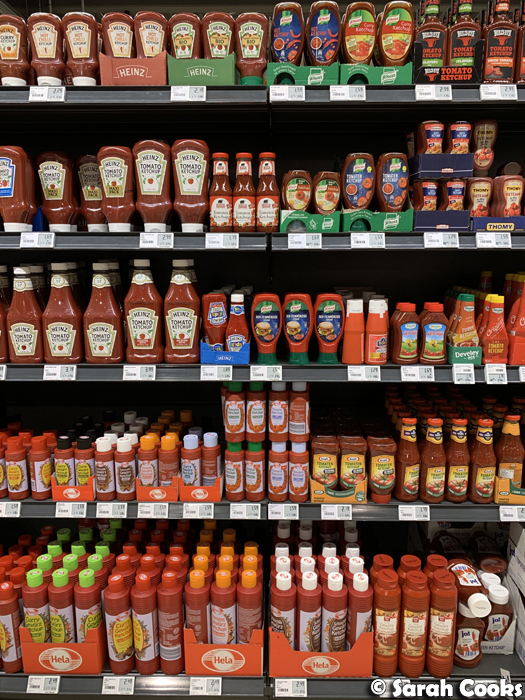 Sneaking in with one bonus photo: the ketchup aisle at the supermarket. German supermarkets are the best!